Our name is derived from the Italian word for “Village” and our concept is inspired by Italian villages as well. Italian villages can have an Old World feel, or serve as a canvas for contemporary Italian fashion or display an eclectic blend of both. It became obvious that even though the style may be distinct and different, each one reflects personality and passion. We have a team of knowledgeable non-commissioned sales people and operational staff who are focused on serving the customer and delivering a product that meets the customers performance and design expectations. We search the world to put together wide variety of tile, stone and decorative pieces from price-sensitive travertine and tiles to rare stones and custom finishes. We put this all together in a professionally designed, interactive showroom that is clean, fresh, friendly and embraces the design and technological capabilities of tile & stone. People who desire tile and stone surfaces to reflect their personal style while meeting their performance and budget expectations. From simple beauty, to sophisticated elegance, from rustic charm to contemporary styling, we work with you to provide products that complement your unique environment. 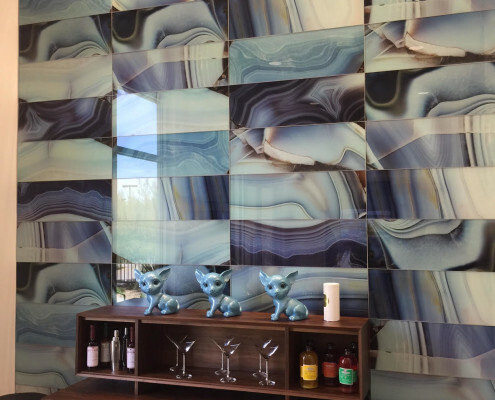 Our Scottsdale showroom was professionally designed by Sherry Engle of SE Designs. You’re invited to come into our showroom to see our incredible selection of exclusive metals, glass, porcelain, ceramics and stones in more textures, sizes and colors than you can possibly imagine. Tell us the area you want to tile, and we’ll provide the products, books, brochures, workshops, expertise and interactive software programs to help you plan an installation that is distinctly yours.